How Dangerous Is It to Pierce Your Tongue? Anne Evans has been writing professionally since 2008. Previously, she worked in the emergency department of a health care trust. Her specialty areas of knowledge are medical, legal, technical and scientific terminology. Evans studied to postgraduate level in applied linguistics at Cardiff University. If you are having your tongue pierced it is essential that you follow scrupulous hygiene in order to avert the risk of infection. The potential for infections as the result of tongue piercing is certainly greater than for piercings elsewhere on the body. In fact, piercing your tongue could be more dangerous than you bargained for. 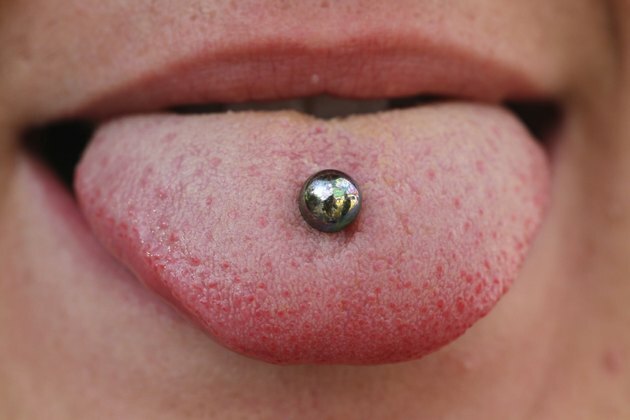 Having your tongue pierced has certainly increased in popularity in recent years. Despite its popularity, however, tongue piercing is a source of disquiet to the British Dental Association. Dr Geoff Craig, BDA chairman, has expressed concern that tongue piercing can be the source of infections. According to a BBC news report about Dr Craig, people who get their tongues pierced could actually be contributing unwittingly to their overall health being at risk. The potential for infections occurring as the result of tongue piercing is certainly greater than for piercings elsewhere on the body, says the British Dental Association. If your tongue swells as a result of it being infected it could easily compromise your breathing by restricting the airway. The British Dental Journal published a report of Ludwig’s Syndrome developing as a direct result of tongue piercing, a condition that potentially is fatal. Another name for Ludwig's Syndrome is Ludwig's Angina. Medline Plus, the online reference library, explains that Ludwig's Angina is an inflammation of the connective tissue of the floor of the mouth, causing cellulitis, which can block the airways. Apart from the swelling tissue causing difficulty in breathing, the danger actually lies in sepsis developing too rapidly to easily be controlled. Ludwig's Angina is a true medical emergency that needs immediate professional assistance as quickly as possible. The mouth is a source of myriad bacteria, some of them are potentially lethal. Placing a piercing through the tongue provides these bacteria with an ideal opportunity to invade the open wound, causing serious infection. This can spread through the body very quickly. Furthermore, Dr Craig, quoted by the BBC, explains that if the piercing equipment was not autoclaved, there are quite significant infection risks. Toxic Shock Syndrome, though rare, does pose a significant risk for people whose oral piercings become infected. Since people's mouths are teeming with bacteria normally, it is not too difficult for Staphylococcus aureus and Streptococcus pyogenes, the two bacteria responsible for TSS, to enter through an unhealed piercing, subsequently releasing their toxins, which can result in a bacterial infection that is potentially life-threatening. A leaflet on Toxic Shock Syndrome from the British National Health Service says that young people are at far greater risk from the effects of these bacteria than other members of the population, and, it is the younger generation that tends to have piercings. Tongue piercing can be the cause of prolonged bleeding because the tongue is a muscle, made up of fibrous soft tissue that is highly suffused with blood. Bleeding from the tongue can be prolonged since the wound is less likely to be exposed to oxygen in the air, a factor that normally assists your body’s clotting process. This bleeding is quite difficult to control and usually requires a trip to a hospital emergency department to get it dealt with adequately. However, according to the Young Women's Health Resource, the antiseptic qualities of saliva can actually assist tongue piercings to heal. By far, the worst that can happen as a direct result of a tongue piercing is endocarditis, which is the inflammation of the membrane surrounding your heart. As the endocardium swells, it puts pressure on the heart muscle, reducing the space available for it to beat properly.